"Every person must live the inner life in one form or another. Consciously or unconsciously, voluntarily or involuntarily, the inner world will claim us and exact its dues. If we go to that realm consciously, it is by our inner work. If we try to ignore our inner world, as most of us do, the unconscious will find its way into our lives through pathology: our psychosomatic symptoms, compulsions, depressions and neurosis. When we don't go to spirit, the spirit comes to us as neurosis." Expressive Art is an exploration of what we do and do not know about ourselves through spontaneous art making. Each month I feature a Spontaneous Collage or an Intuitive Drawing with accompanying reflections in the creative spirit of looking into the inner life. 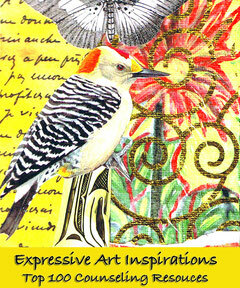 Expressive Art Inspirations was a featured Typepad Blog on April 13th, 2012. WHY WE THINK EXPRESSIVE ART INSPIRATIONS ROCKS: When a blog wins the Canadian Weblog awards, is linked to by Psychology Today and Psych Central and is considered one of the top 50 art therapy blogs in the world, you know you've found something really special. Expressive Art Inspirations is a deep, honest and penetrating look into art therapy and the truths of life and art, offering compelling, vibrant content that is bound to make it your new favorite art blog. 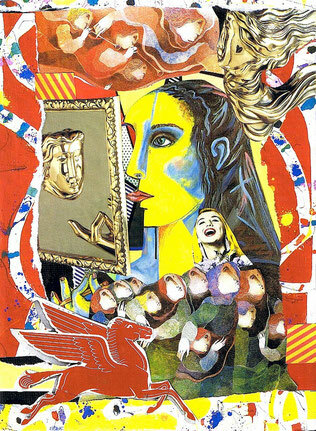 This blog offers information about using various types of art and expression as a means of psychological healing. It provides knowledge on using one’s creativity to heal mentally and emotionally.